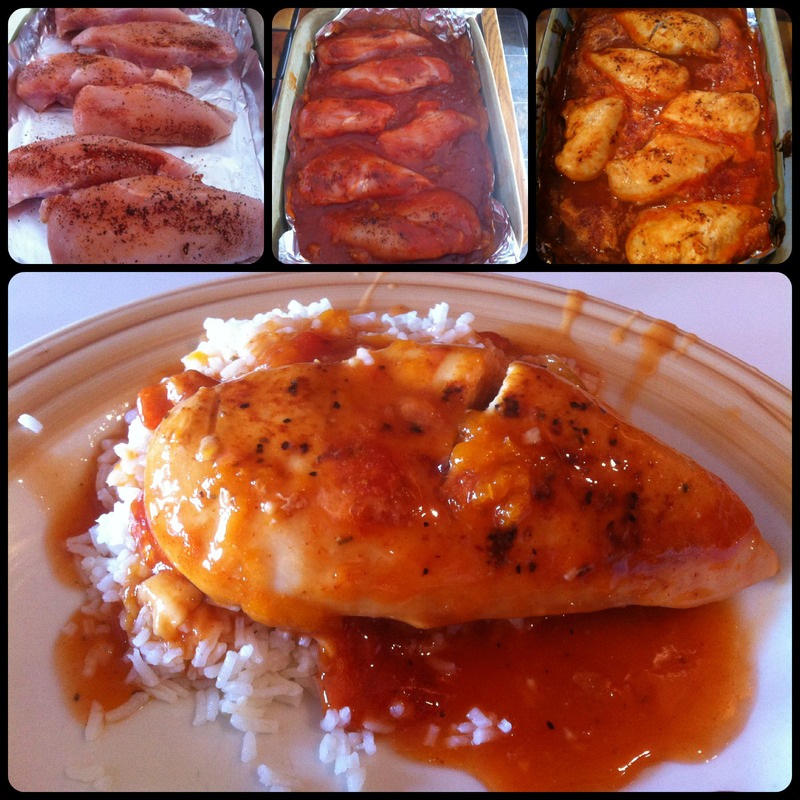 A good friend of mine sent me a Sweet & Tangy Russian Chicken recipe the other day. She said her men in the field absolutely loved it!! Soo…. the other day I had to give it a try. I adapted the recipe slightly to fit with what I had to work with in my pantry! Even though it wasn’t exactly the same it was pretty damn close… & after T took one bit he was oooing & awwwing until it was all done! He said “This is the tastiest chicken ever.. & cooked to perfection!” T is like my Gordon Ramsey if I were on Hell’s Kitchen.. I want him to be happy. The only difference is T doesn’t ever yell… & he loves absolutely everything I make. But that’s alright with me, seeing he is the only one I am cooking to impress 99.8% of the time! 2)Place the chicken breast in a baking dish. & apply pepper & Cajun seasonings rub. 3) In a bowl mix Catalina dressing, Apricot Preserves & onion Soup Mix. Mix well. 4) Pour half of the sauce over the chicken. Flip chicken to ensure both sides get covered. Pour other half of sauce on. Flip chicken back upright. 5) Back uncovered for 1hr 10min. (use your own discretion). Flip Chicken at 30 minutes. Flip back at next 30 min. Cook for 10 more minutes. 6) DONE! Take it out.. & serve it over hot white rice! This is soooo unbelievably tasty! Thank you sooo much Mrs.M for the recipe idea. It is will be a go to favorite that is for sure. This could also be a crock pot recipe! My favorite thing about it, was its a no fuss, no mess quick easy fun meal! With the leftover chicken breasts, I shredded them & left them in the sauce. So tonight for supper we are having Chicken Tacos!